We now come upon a series of wars growing out of the policy of removing the Indian from his old home to the region west of the Mississippi. The preservation of peace on the frontier, and the transfer of the tribes from State to national jurisdiction were the principal reasons for this policy, which was adopted in 1830. There were at this time one hundred and twenty-nine thousand Indians within the limits of the old States, and the step seemed both wise and humane. Its authors did not imagine the rapidity with which settlements and population were to spread westward. It was not until the war of 1812–15 with England had ended that the Mississippi Valley was thoroughly explored and emigration to it began. By the cession of their lands to the United States, the Indians were enabled to procure the means necessary to their advancement in the social scale. They bought cattle, and implements of husbandry, and founded schools, and a life of industry commenced. A new era had dawned upon the race. The Choctaws were the first to exchange their lands for a tract west of the Mississippi. A new and striking feature in the treaty they made was the appropriation of the proceeds of fifty-four sections of the ceded lands, each one mile square, for a school fund. Provision was also made for the support of the deaf, dumb, and blind of the tribe. The Indian Bureau—the department of the government in which Indian affairs are transacted—was established in 1824, and in the following year the plan of removal was presented to Congress by President Monroe. The first effectual steps towards removal were taken by the treaty of January 24, 1826, by which extensive cessions of territory were made by the various tribes. To some of these, especially the Creeks and Cherokees, who had made a considerable advance towards civilization, removal was extremely distasteful and was long resisted. Between the years 1820 and 1840 most of the tribes had removed. For seventy years the Sac and Fox tribes had dwelt in the Rock River Valley, Wisconsin. This and the adjacent territory these tribes had ceded to the United States in 1804, upon the condition that they might continue to reside and hunt on the lands until they were needed for settlement. These tribes at this time numbered about three thousand, one-fifth of whom were warriors. In 1829 the period of settlement had arrived, and the Indians were notified to remove to the west side of the Mississippi River. Many of them, among others the Sac chief Keokuk, did so, establishing themselves on the Iowa River. A party, under the old chief Black Hawk, refused to remove. They were strengthened in their determination by the advice of the Prophet Wabokeshiek, or White Cloud, who had great influence over them, and who told them that their British father at Malden stood ready to help them. Black Hawk, the Sac chieftain, was born at the Sac village on Rock River, in the year 1767. Distinguishing himself as a warrior, he rose by merit alone to the station of chief. He had gained many victories over the Osage tribe, and had fought by the side of Tecumseh, when that great leader fell. The ancient allies of Great Britain, his band annually visited their British father at Malden, and received many presents. To the chief himself a medal had been awarded for his fidelity to the British. The features of Black Hawk denoted great firmness of purpose, and his wisdom had gained him the respect of his own and the surrounding tribes. Frequent ill-treatment from the Americans, who in violation of the treaty had settled upon the Indian lands before they were sold, and the introduction of the whiskey traffic and its attendant evils, had made Black Hawk and his band still more unfriendly and unwilling to give up their old homes. They were, however, compelled by force to abandon them in June, 1831. An insufficient supply of corn had been provided for the Indians, and before the autumn had passed, Black Hawk and his band were suffering for want of food. They had been obliged to abandon their own growing crops, and had reached their new location too late in the season for planting. In the following April they recrossed the Mississippi, and ascended the Rock River to the territory of their friends, the Winnebagoes, having been invited thither to raise corn. Regarding this as a hostile act, General Atkinson, then at Fort Ann strong, at once ordered Black Hawk and his followers to return. The chief, jealous of the superiority of his rival, Keokuk, and feeling that his nation had been wronged, had made up his mind to defy the power of the government, and with his small band to make war upon the United States. A sense of personal injury also impelled him to this unwise determination. Under the pretence that he had done them a wrong, some white men had fallen upon and severely beaten him a little time before. 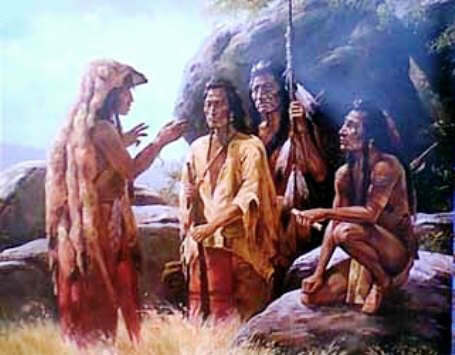 Black Hawk now sought the help of the Chippewas, Ottawas, Winnebagoes, and Potawatomies, and, expecting their aid, refused to obey General Atkinson's order. Soon finding, however, that the assistance of those tribes could not be depended upon, he resolved, if overtaken, to return peaceably. Receiving intelligence of the approach of a body of mounted volunteers, he sent three of his young men with a flag to meet them and conduct them to his camp near Sycamore Creek. "When the news came of what had happened," said Black Hawk, referring to the capture of his messengers and the killing of the two Indians, "nearly all my young men were absent about ten miles off. I started with what I had left—about forty—and had proceeded but a short distance before we saw a body of the enemy approaching. I raised a yell, and said to my braves, 'Some of our people have been killed—wantonly and cruelly murdered. We must avenge their death!' In a little while we discovered the whole army coming towards us at full gallop. We were now confident that our first party had been killed. I immediately placed my men in front of some bushes, that we might have the first fire when they were near enough. They halted at some distance from us. I gave another yell, and ordered my brave warriors to charge upon them, expecting that we would all be killed. They did charge. Every man rushed and fired, and the enemy retreated in the utmost confusion and consternation before my small but brave band of warriors. After pursuing them some distance, I found it useless to follow them, they rode so fast, and returned to my camp." In this disgraceful and unfortunate affair, all the baggage, camp equipage, and provisions of the troops, fell into the hands of the Indians. Black Hawk finding that his peace flag had been fired upon, and intoxicated with his success, was now more than ever determined on war, and, in consequence of this success, was joined by a band of Winnebagoes. Consternation spread throughout the State of Illinois. The Governor called for more mounted volunteers, and the Secretary of War at Washington sent one thousand troops from the East, who were to be under the command of General Winfield Scott. While on their journey, these troops were attacked by an enemy far more terrible than Indians—the Asiatic cholera. Many of them died, and the remainder never reached the scene of action. A characteristic feature of this disease was the rapidity with which it terminated in a fatal result—a few hours only intervening between the appearance of the first symptoms and death. Besides the Sacs and Foxes, a few of the Winnebagoes, Menomonees, and Potawatomies, took part in the conflicts that ensued. The Winnebagoes inhabited ten villages upon the Wisconsin River, and could muster some five hundred warriors. They had fought against the Americans at the Miami, at Tippecanoe, and in the War of 1812. The Menomonees, a small tribe on the river of that name, could muster but one hundred warriors. A few of these joined the Americans against their old foes, the Sacs and Foxes. The Potawatomies occupied the territory adjoining the south end of Lake Michigan, and numbered between three and four thousand. After the affair with Stillman, the Indians separated into small bands, and for a brief season the usual horrors of border warfare were enacted. A fierce attack was made on the fort at Buffalo Grove, near Dixon's Ferry, but the Indians were driven off with some loss. In an engagement on the banks of the Wisconsin, with a large body of troops, under General Dodge, the Indians were routed, and while attempting to descend the Wisconsin upon rafts and in canoes, many, including women and children, were killed or taken. Black Hawk and his followers fled across the country, hoping to put the Mississippi between them and their pursuers. After a harassing march, his starving and worn-down band was overtaken by General Atkinson's forces at the junction of the Bad Axe River with the Mississippi, where the steamer Warrior opened fire upon them. Next morning, while the Indians were endeavoring to cross the river, they were attacked by the troops, and one hundred and fifty of them were killed. Black Hawk himself, with a few others and most of the women and children, escaped; thirty-nine women and children were taken prisoners. The war was over. It had been of brief duration, and the excitement it had caused was out of all proportion to its slight importance. Black Hawk, speaking of this catastrophe, said, that when the whites came upon his people they tried to give themselves up, and made no show of resistance until the soldiers began to slaughter them, and then his braves determined to fight until they were all killed. What renders this probable is the fact that when Atkinson's troops charged upon the Indians, men, women, and children were seen mixed together in such a manner as to render it difficult to kill one and spare the other. Black Hawk and some other chiefs soon afterwards gave themselves up, and were confined for a time at Fortress Monroe. When released they were taken to the principal eastern cities. At New York they witnessed a balloon ascension from Castle Garden. "Is the air-ship going to see the Great Spirit?" asked one of them. "He is a great brave," said another, referring to the aeronaut; "he must be a Sac." They visited many public places of interest, and were greatly pleased with what they saw. "Black Hawk has done nothing for which an Indian ought to be ashamed. He has fought for his country against white men, who came year after year to cheat the Indians and take away their lands. The cause of our making war is known to all white men. They ought to be ashamed of it. The white men despise the Indians, and drive them from their homes. They speak bad of the Indian, and look at him spitefully. But the Indian does not tell lies; Indians do not steal. "An Indian who is as bad as the white man could not live in our nation; he would be put to death and eaten up by the wolves. The white men carry false looks, and deal in false actions; they shake the poor Indian by the hand to gain his confidence, to make him drunk, to deceive and ruin him. They poisoned us by their touch. We were not safe. We were becoming, like them, hypocrites and liars. "Things grew worse. We looked up to the Great Spirit. Our squaws and papooses were without food to keep them from starving. We called a Great Council and built a large fire. The spirit of our fathers came and spoke to us, to avenge our wrongs or die. We set up the warwhoop, and the heart of Black Hawk swelled high in his bosom when he led his warriors to battle. I fought hard, but your guns were well aimed. "Farewell, my nation! Black Hawk tried to save you and avenge your wrongs. He has been taken prisoner and his plans are stopped. He is satisfied. He has done his duty; he can do no more. He is near his end. His sun is setting and will rise no more. He will go to the world of spirits contented. Farewell to Black Hawk!" A few years later he died at his camp on the River Des Moines. He was buried on an elevated spot, in his war dress, in a sitting posture, and with distinguished honors from his tribe. In the grave were placed many of the old warrior's trophies, together with his favorite weapons, and the cane given him by Henry Clay. Washington Irving describes Black Hawk as having "a fine head, a Roman style of face, and a prepossessing countenance." Wabokeshiek, the prophet, who had been more influential perhaps than any other person in rousing the war spirit of the tribe, was coarser in figure, with less of intellect, but with the marks of decision and firmness. This story of the Black Hawk War is featured in the book entitled the Indian History for Young Folks by FrancIs F. Drake and was published by Harper Brothers in New York and London in 1919.